This post concerns an interesting gastropod (snail) that belonged to the extinct actaeonellid family. Actaeonellids lived only during the Cretaceous, and during this time, they were one of the most common members of shallow-marine communities that were widely distributed in a belt of tropical (and to a lesser degree subtropical) waters that paralleled the equator. Common associates are rudistid bivalves (see one of my previous posts for October, 2014). Rudistids and actaeonellids went extinct at the end of the Cretaceous. Over the years, I have accumulated several specimens of the actaeonellid Trochactaeon packardi (Anderson, 1958). 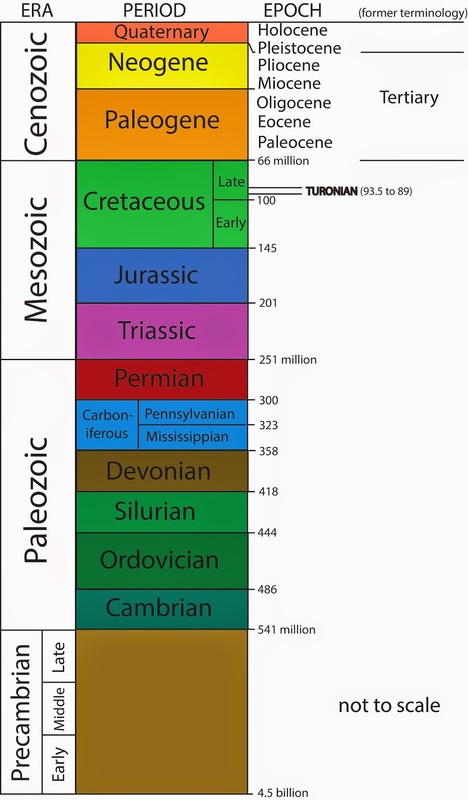 This species is found in northern and southern California, and the species lived during Turonian time (approximately 92 million years ago--see above), which was the warmest time of the Cretaceous. The specimens shown below are from the Turonian-age Baker Canyon Member of the Ladd Formation in the Santa Ana Mountains, Orange County, southern California. Like many actaeonellids, Trochactaeon packardi is characterized by a cylindrical shell with a low spire at the top. The specimen shown above is 4.6 cm in height and 2 cm in diameter. This view (front) is of its aperture, where the soft-bodied part of the gastropod would have been able to extend itself somewhat out of its shell. This is the abapertural (back) view of the same specimen shown above. The shell is smooth, which would have allowed to shell to be streamlined (perhaps for burrowing); a useful feature for a carnivorous animal. This is a second specimen (height 6 cm, diameter 3 cm). Its anterior end is well exposed and shows two prominent plicae = spiral features near the anterior end (a third one, positioned nearer the anterior end, is much weaker). These plicae are very important in the identification of this gastropod. 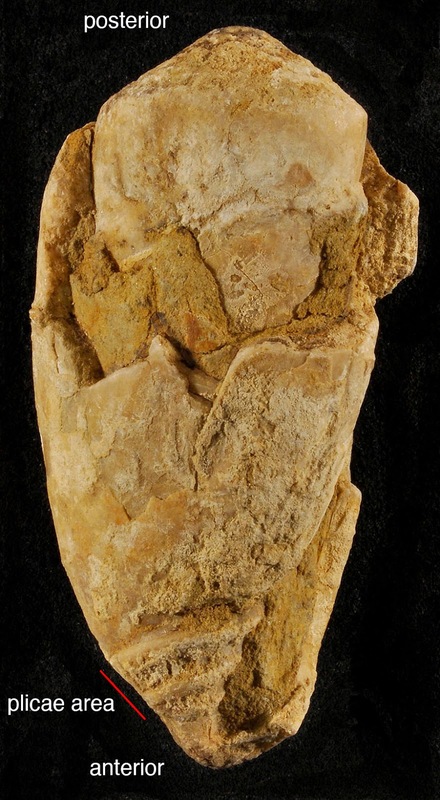 This third specimen (height 5 cm, diameter 2.8 cm) was cut in half (from top to bottom) in order to expose its very characteristic internal structure. There has been some crushing of some of the thinner internal shell walls. 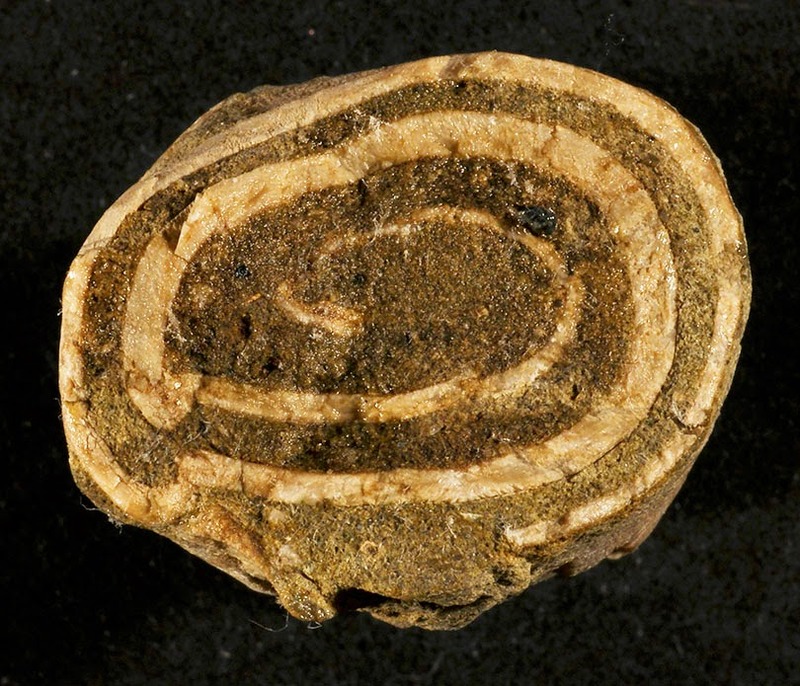 This last view is of a specimen (3.7 cm in diameter) that was cut in half (from side to side). Actaeonellids have more revolutions of the shell wall than are normally found inside of most gastropod shells.